As drones become more and more common among the military, regular folks, and bad guys alike, security fears about unmanned aircraft systems continue to mount. It’s just about impossible to tell whether an in-flight UAS is friendly – and when a drone is headed toward a restricted area like the White House or a prison yard, there’s no time to ask questions. Battelle, a tech-development company that seems to have its hand in just about every industry imaginable, has developed the DroneDefender to easily secure sensitive areas from drones. 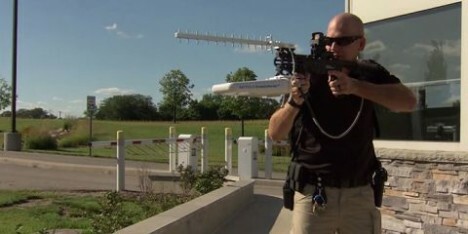 It’s a shoulder-mounted anti-drone weapon that kills the flying machines with invisible bullets made of radio waves. 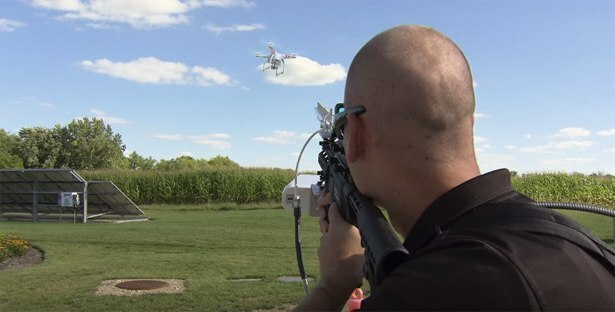 The ten-pound device can swat drones out of the sky from up to 400 meters away. Its shot jams up most GPS and ISM frequencies to disable the device and prevent it from spying, carrying weapons, detonating, or whatever else its goal (or rather, its operator’s goal) might have been. The DroneDefender doesn’t actually physically harm the drone – it just quickly and effectively neutralizes the potential threat.